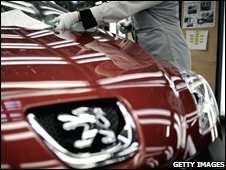 French car company Peugeot Citroen has announced plans to shed 2,700 jobs because of falling demand in Europe. It predicts sales volumes will fall by at least 10% in 2009, following a 17% drop in the last quarter of this year. The company said the job cuts would affect assembly-line workers, managers and office staff. In October this year, Peugeot Citroen cut its profit forecast for 2008 and started "massive" production cuts in the wake of a global downturn. The carmaker also plans to move 900 workers from its French factory in Rennes to other sites, under a plan which is to be presented to its works council on 2 December. Peugeot Citroen human resources director Jean-Luc Vergne said urgent action was needed in order to protect the future of 200,000 employees. The group's sales fell 5.2% in the third quarter. According to the European carmakers' association, Acea, new car sales in Europe dropped by 14.5% in October, the sixth monthly fall in a row. Peugeot Citroen's announcement is the latest in a series of drastic measures taken by car companies worldwide in order to prevent the build-up of unsold stock. Daimler is reportedly considering lowering the working week in Germany from 35 to 30 hours and reducing the number of its temporary workers "to increase flexibility".